We have been covering some of the foods that are very typical of Mumbai. We last covered Vada Pav and the next item we are covering is Bhelpuri or Bhel. Bhelpuri is a puffed rice dish with potatoes and a tangy tamarind sauce. It is a type of chaat or small plates of savoury snacks, particularly identified with the beaches of Mumbai (Bombay), such as Chowpatty. - The Bhel is made using rice puffs, tomatoes, potatoes and onions. - Chutneys - There are two popular chutneys used, a dark purple sweet one made mainly of dates and tamarind, and a green spicy chutney made of coriander leaves and green chillies. Different chutneys impart a sweet or spicy flavour. - Puri and Sev - A Puri is fried piece of wheat dough just like a pringles chip only thicker. Sev is a fried snack shaped like thin noodles (see picture below). These three groups of ingredients are mixed in a bowl as per the eater's preferences. Some prefer it more sweet while others prefer it spicy. Bhelpuri is best consumed as soon as it is made. If left for a while, the juices from the tomatoes, chutneys, etc. combine to render the sev and puffed rice soggy. Another variation is to sprinkle the chat with chunks of diced sweet mango. The finished snack is often garnished with a combination of diced onions, coriander leaves and chopped green chilis. 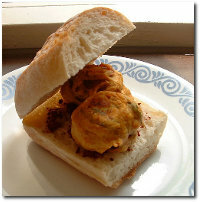 It is sometimes served with papri puris, a deep fried small round and crispy wheat bread. The result is a sour/pungent/sweet tasting evening snack that is a treat for the taste buds and a good source of carbohydrates and minerals. Dahi puri - a mixture of bhelpuri, chutney, papdi and savoured with lot of youghurt. 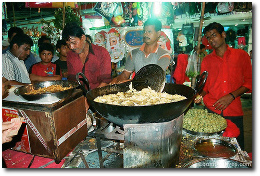 Bhelpuri is called Churu Muri in Bangalore and Jhaal Muri in Kolkata (meaning "hot puffed rice"). In Sangli, a dry variant of Bhelpuri popularly known as Bhadang is consumed after garnishing with onions, corriander and lemon juice. Much like the Vada Pav vendors, you will also find Bhel being served at small Bhel vendors spread around the city. However, you are likely to find the better Bhel stalls at the beaches. In other countries, you are likely to find Bhel on the menus of many Indian restaurants but if you are lucky to have a Little India in your city, you can almost be sure you will find Bhel there. Some of the local Indian Grocery stores also serve Bhel packets.